Hiring a cleaning service you can trust can be a daunting task. With so many available options, from franchises to mom-and-pops to individuals, and prices ranging from $10 an hour to $45+ per hour, it is easy to get lost in the process. Here are some recommended questions to ask to facilitate an apples-to-apples comparison, and ensure the person(s) you finally hire are properly prepared to care for your largest asset – your home. Are you insured? What happens if something in my home is broken or damaged? Proper insurance (at least one million dollars in coverage – two million is better) is vital. An uninsured company will absolutely be cheaper, but when the finish is eaten off your wood floors, your stainless steel appliances are scratched, or your grandmother’s vase is broken, they are also the ones who will not be able to afford to compensate you for it, leaving you to foot the bill. Always verify insurance coverage through the company’s insurance provider. Ideally there should be a written policy in place regarding procedures for dealing with breakage/damage. Ask to see it. Do you carry workman’s compensation insurance on all of your employees? Workman’s comp is required for all employees under Colorado law, yet very few cleaning companies comply because it is so expensive. This opens you up to significant risk of lawsuit if a cleaner is injured in your home. The risk is even greater with an independent maid, since technically YOU are their employer. How do you prescreen your employees? Does the company check references? Perform criminal background checks? Are they willing to provide proof? If they are an independent cleaning person are they willing to provide you with a copy of their own background check at their expense? Unfortunately it is not uncommon for independent housecleaners to begin cleaning because they cannot find another job due to a past criminal conviction. What does your training program consist of? The turnover in the industry is high, and many services are just desperate for warm bodies to throw out there and get the work done. It is not uncommon for new hires to get very little training, or no training at all. The best companies will have formal, documented, on-going training programs. This helps ensure consistency in quality and reduce the turnover of the staff who clean your home. Can you provide me with a written checklist of tasks to be performed? This is extremely important. Different companies have different ideas of what a basic service consists of. It is important to know exactly what you are paying for, and know you are truly comparing apples to apple when making a final decision. Some of the more common areas of potential confusion are dishes, stripping and making of beds, laundry, high dusting of ceiling fan blades, high reach window sills, handling of children’s toys, and the handling of the trash throughout the home. You can save yourself a lot of potential grief by getting written specifications upfront. Do you have a formal quality assurance program in place? What methods do the company use to measure quality on an ongoing basis? Do they perform regular quality checks, mail surveys, leave behind comment cards, or do follow up phone calls? If so how frequently? Do they have a specific person in charge of quality assurance? 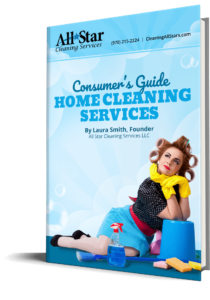 What happens if I am unhappy with my cleaning? Some cleaning services only offer a specified percent off your next service if you are displeased. If you are dissatisfied and they won’t fix it, why would you even want to use them again? A reputable service should come back immediately and do whatever necessary to fix the problem, or be willing to offer you your money back. Who provides the equipment and supplies? Look for a company who provides all of their own supplies and equipment. Employees are less likely to misuse (Windex on granite countertops, green scrub pads on the stainless steel stove, etc.) products they are familiar with and trained to use. Additionally, providing supplies for your cleaner can easily add hundreds of dollars a year to your total cleaning bill due to the high volume of product used in a thorough cleaning.